We launched our latest product for the rail and trackside markets at this years Rail Live show. Entitled the EasyRail, we have designed and developed a 6-person site welfare unit ideally suited to provide clean, comfortable and legally compliant welfare facilities for trackside contractors delivered to the exact place where they are working. 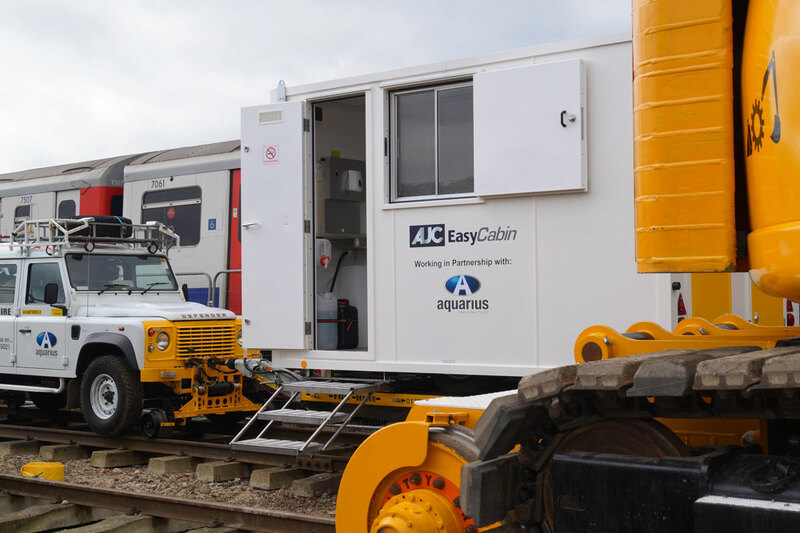 Operating in close collaboration with the Road2Rail specialists, Aquarius Railroad Technologies Limited, the EasyRail welfare unit is mounted onto an Aquarius Road2Rail trailer and coupled to an Aquarius R2R4X4 vehicle. The complete unit is then transported directly from road to rail, then straight to site, so that track workers can have instant access to important welfare facilities. Essential to modern working arrangements, the EasyRail welfare unit incorporates some environmentally biased features. These include LED lighting and a 12volt power system which means that the on-board generator is only powered up when the batteries need a recharge, saving fuel costs and reducing emissions. The EasyRail welfare unit has been Performance Asset Rated at 56 C ? rated; which allows AJC to describe the unit as ‘Very Eco-Friendly’. We officially unveiled the EasyRail on the Aquarius stand at Rail Live”, continued Mark, “and we were delighted with the positive response we received from contractors that carry out rail work. We firmly believe that the EasyRail will transform the health and welfare of rail workers and help towards increased efficiency and productivity.